without having a hit or being a star." (January 2014) "When Rob Oakie (of MUSIC PEI) told my daughter Savannah that I was going to receive this award, he wanted to keep it a secret and surprise me at the awards show (on February 2nd). She told him that probably wasn’t a good idea knowing me. 'It might give him a heart attack', she laughed. What have I achieved over a life time in the music business? Too many gigs to count (but probably in the number of about 7000). I’ve sold maybe a total of 10,000 copies of my own recordings altogether. I haven’t had much radio airplay. TV exposure has been a few CBC appearances, and a regular performer on the Cable 10 Telethon. But I have been able to make most of my living for four decades in the music business without having a hit or being a star. Getting into folk music in the 70's, the 80's and beyond, there were Bruce Cockburn, 'Ryan’s Fancy', 'The Irish Rovers', The Barra MacNeils, The Rankins and 'Great Big Sea' (GBS were in regular rotation at the Olde Dublin Pub with my group “Jar O’Comfort”). Of course, meeting Richard Wood was one of the most fortunate happenings of my life. Playing music with him regularly from when he was a teenager has led to many notable adventures all over the world. We have stood together through thick & thin, still do, and I love him. Other Island musicians I’ve worked with on stage and in the studio are literally too many to mention. I am constantly amazed at the diversity, and talent level of young and old here on the Island, from the fearlessness of a 16 year old Cynthia MacLeod when I first met her, to the improvisational genius of the late Doug Riley. I don’t want to try to list everyone for fear of forgetting some, but they have all contributed to my career. Lifetime achievement? My greatest lifetime achievements are here on stage. Talking my sweetheart Charlene into marrying me 41 years ago, and the family that has grown around us. That’s the best lifetime achievement! 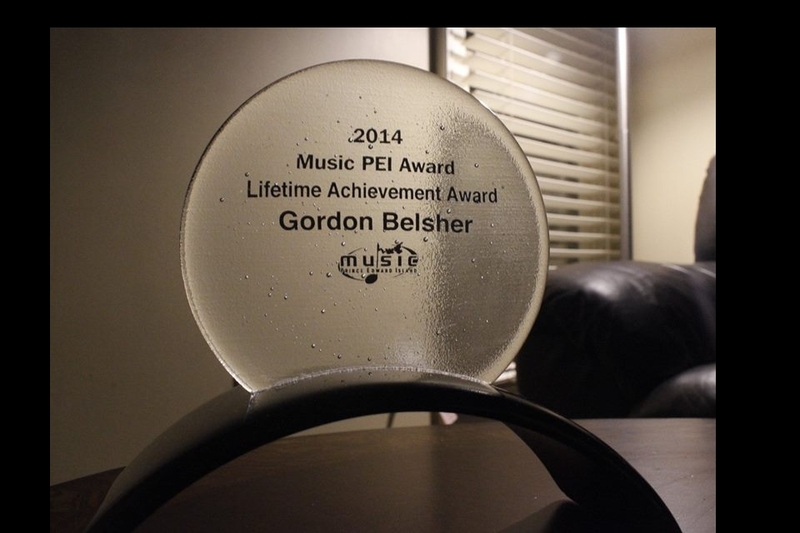 I’m truly humbled with this award and thank MUSIC PEI for the honour. And if the powers that be will allow, I’m not done yet!"